Unfortunately for those of us with crappy internet, digital downloads of PS4 games will clock in at around 50 gigabytes. Sony Worldwide Studios boss Shuhei Yoshida has been debunking rumours left and right in the wake of Sony's big PlayStation 4 reveal event, and this time he has told The Guardian that all PS4 games will be available as digital downloads. He said that users downloading PS4 games might want to take advantage of the PS4's ability to download games and updates in standby mode, as they will clock in at a massive 50 gigabytes. For contrast, new release PC games downloaded via Steam average anywhere from 5-15 gigabytes. Those of you who still prefer to buy physical, worry not, for the PS4 will still focus on discs for the next few years. "We're shifting our platform more and more to the digital side - PS4 will be similar to PS Vita in that every game will be available as a digital download, and some will also be available as a disc," Yoshida said, in response to a question about how the PS4 will better support smaller development studios. "The Witness will be a digital release and because of the flexibility of the digital distribution scheme, we can have more small games that might be free or available for a couple of dollars, or different services like free-to-play or subscription models." Yoshida claims that the focus on digital downloads and cloud computing is to make the gaming experience more instantaneous. He wants playing a game to be like watching a TV show. You should be able to turn it on and play straight away without having to sit around waiting for patches and downloads. "Waiting for downloads - That's ridiculous, that's crazy! We want to get out of this madness with PlayStation 4. The games are big, they're 50GB; download isn't instantaneous. So we're making purchase available from any device, so when you're at work, you can spend a couple of moments looking at PlayStation Store and choosing a game, and straight away it starts to download at home." PS4 downloads will utilize a "progressive download" system, says Yoshida, which means you won't have to wait for the whole thing to download before you start playing. "Once you have the minimum amount of data downloaded you can begin the game, and while you play, the remaining data downloads." Currently, a large number of PS3 games are available as digital downloads at a cheaper price than their physical retail versions. 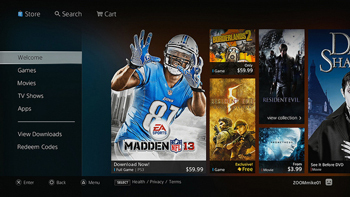 The success of PSN, Xbox Live Arcade and Steam have pushed digital distribution into the forefront this generation. Downloaded titles on the PS3's PSN, including full PS3 games and digital-only titles like Castle Crashers and Fat Princess, won't transfer to the PS4.